Discovered being beaten nearly to death on a dusty street in Juarez, Mexico, life was barely worth living for a horse named Rafael. He had been pulling a decrepit cart overloaded with scrap metal. The harnesses cutting into his body had not been removed for months, perhaps years. A good Samaritan put a halt to the beating, then offered $200 to Rafael's owner. Within minutes, Rafael, once a beaten 'beast of burden' was given his freedom. APRODEA, an animal rescue group in Juarez, brought Rafael to a local dog shelter where he received limited veterinary care over several months. Blood tests determined that he suffers from kidney disease and severe malnutrition. It was later learned that he had been fed a meager diet of tortilla chips and junk food. Two non-profit rescue organizations were notified that Rafael needed help and a permanent place to live. Compassion Without Borders (CWOB) and Center for Animal Protection & Education (CAPE) raised over $5000 to pay for his medical care in Mexico and the costs to drive him from El Paso, Texas, to Grass Valley, California. An online petition was circulated about Rafael's story and the plight of horses, mules, donkeys and other animals forced to do hard labor under inhumane conditions in Juarez and around the world. 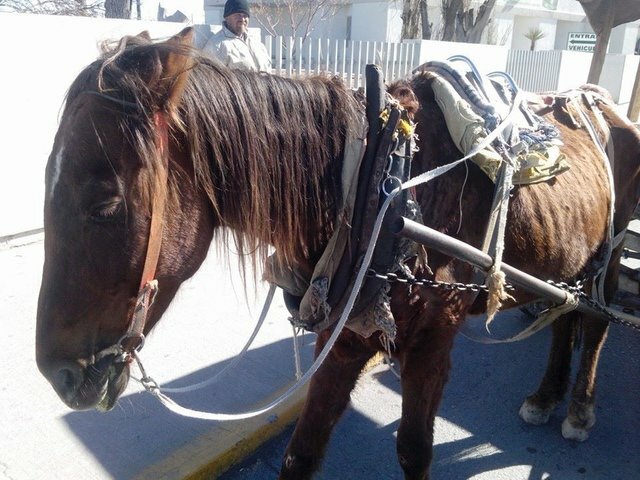 Enrique Serrano, the mayor of Juarez, will be receiving 190,000 signatures demanding that a law be implemented in Juarez to protect these animals by requiring rest periods, adequate food and water and that they be harnessed humanely to carts in good working order. On a bright September morning among the rolling, oak tree studded hills of Grass Valley, a truck pulling a horse trailer turned onto the driveway of the CAPE Animal Sanctuary. Watching with cameras pointed, two dozen people quietly welcomed Rafael to his new, permanent home. When the trailer door opened, Rafael delicately stepped out. People whispered quietly clearly shocked at how thin he was. A small girl extended a carrot to him which Rafael gently nibbled. Walking slowly, Rafael explored his new home, meeting goats, burros and many CAPE volunteers. After years of living chained and harnessed to a dilapidated, overloaded cart, Rafael was at last free to roam the land, exploring the sanctuary, occasionally nibbling grass, or just gazing across the hills. To help with Rafael's medical costs please donate to the CAPE Animal Sanctuary where animals with special needs are given care the rest of their lives. The Center for Animal Protection and Education (CAPE) works to save the lives of individual animals and to educate people about how choices they make in their own lives alleviate animal suffering. In 2012 CAPE established the CAPE Animal Sanctuary in Grass Valley, California. Focusing on animals with special needs and our burro rescue program, the CAPE Animal Sanctuary is now the permanent home to dozens of animals. CAPE also sponsors, supports and produces educational programs designed to inform people about issues animals face in society today. Please visit our Animal Film Festival page to learn more about one of our most important educational outreach events. CAPE's philosophy affirms that all animals have the right to a long, full life, free from pain and suffering.